Märklin’s 3600 and 5100 track systems both shared the same geometry. Standard straights and curves had the same length and radius as the points and these in turn had the same shape as the crossings. All in all, just about any element in a layout could be replaced with another one without affecting the adjoining pieces. Shown in this diagram at the left is a simple siding using standard elements. 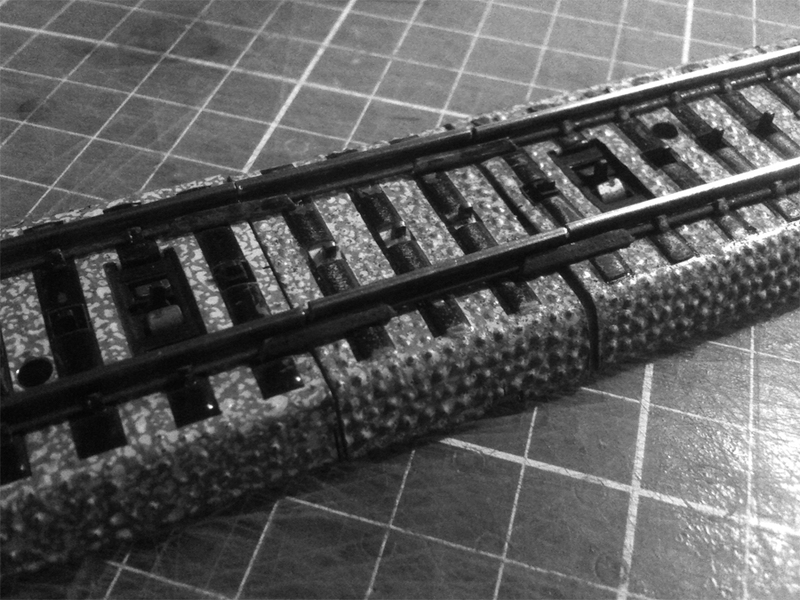 At the right, the curve has been replaced with second set of points, turning the track figure into a cross-over without affecting any of the other pieces. This all works very nicely until one decides to instal a double slip crossing. While the curves are identical to the standard, the straights of these measure 193mm in length, 13mm more than a standard straight. This difference causes the neat grid line to be offset incrementally with each additional parallel track. A similar problem arises when points are installed on a diagonal. In order to maintain the standard parallel spacing, the straight needs to be 13mm longer. What is required to rectify this problem is a compensating piece that is 13mm long. 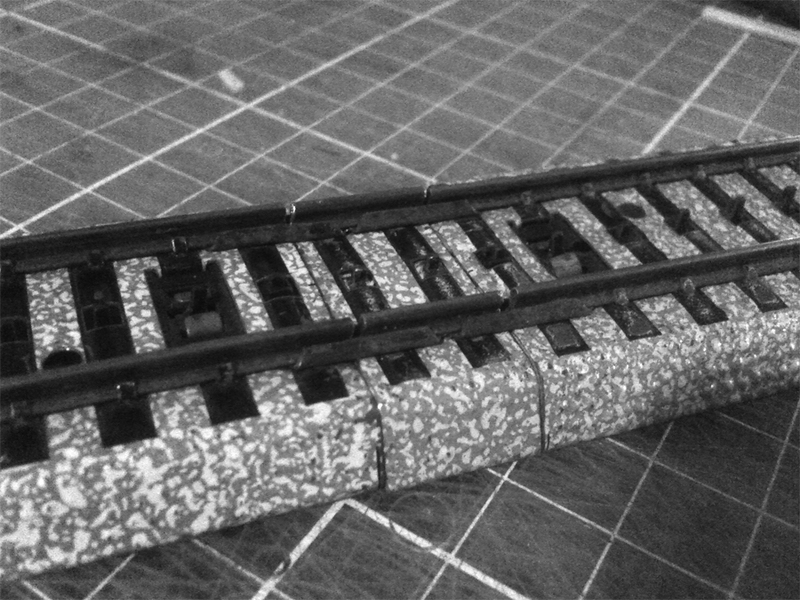 Märklin never produced such a track element; why this is so is a mystery and thus the title of this post suddenly makes sense! With a bit of skill and fairly simple tools, it is possible to make these elements yourself. Methods of how to to go about this are shown below for both 3600 and 5100 series track. A 13mm piece on the left and a 26mm piece on the right. With this type of track, use is made of existing attachment points for the centre rail. A piece of cardboard slides in at the bottom to align and secure the pieces. The rails are loose and held in place only by the fish plates. Electrical connections are provided by the standard lugs, modified slightly for the shorter piece. Straighten out the tabs holding the centre rail and remove this carefully, along with the two central insulators. Gently lever the rails out of their fixings and save them, as well as the connecting lugs for later. Mark and cut a section of the road bed to the required length, making sure one of the holes for the insulator plate is in the centre. The cuts must be nice and square. Clean up the cut edges with a file and some emery paper. Using the hammer, carefully tap the sleepers flat in the area where the rails will sit. 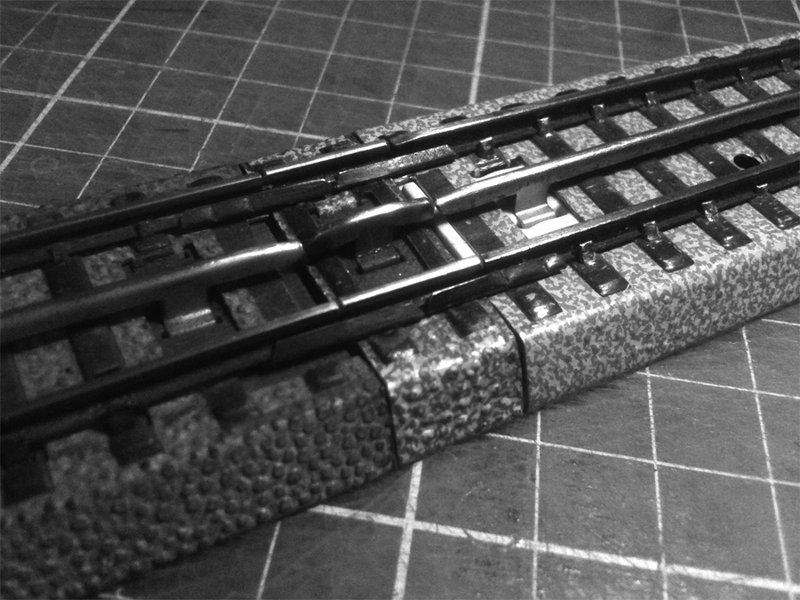 Cut a length of the centre rail to match the road bed piece. Clean up and end the ends down slightly. This will prevent the collector shoes on the trains from getting caught. 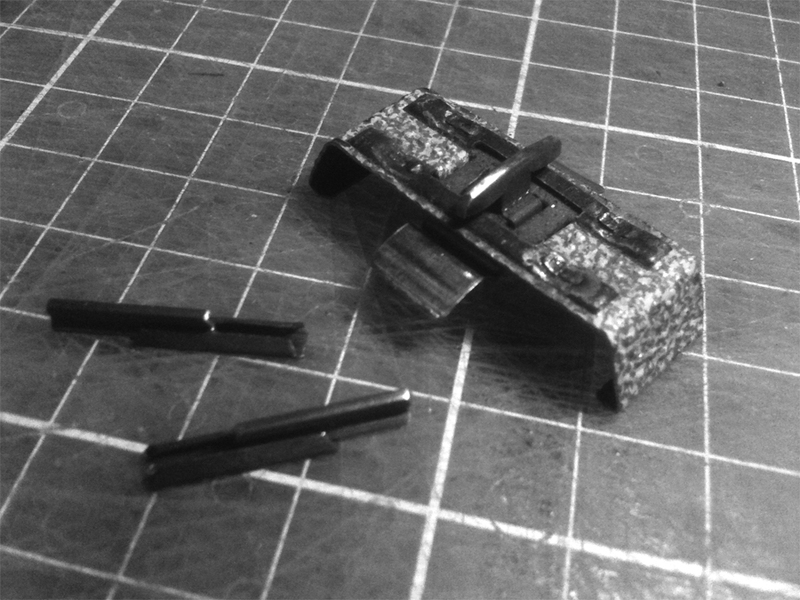 For a 13mm piece, flatten out the kink furthest away from the slots in the two connecting lugs and then shorten those ends by about 8mm. 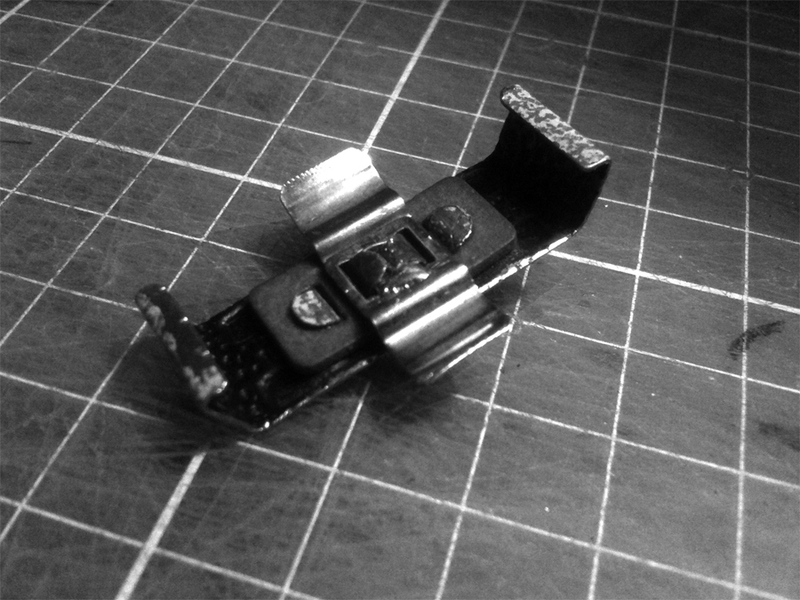 This is not necessary for a 26mm piece, the lugs can be used as they are. 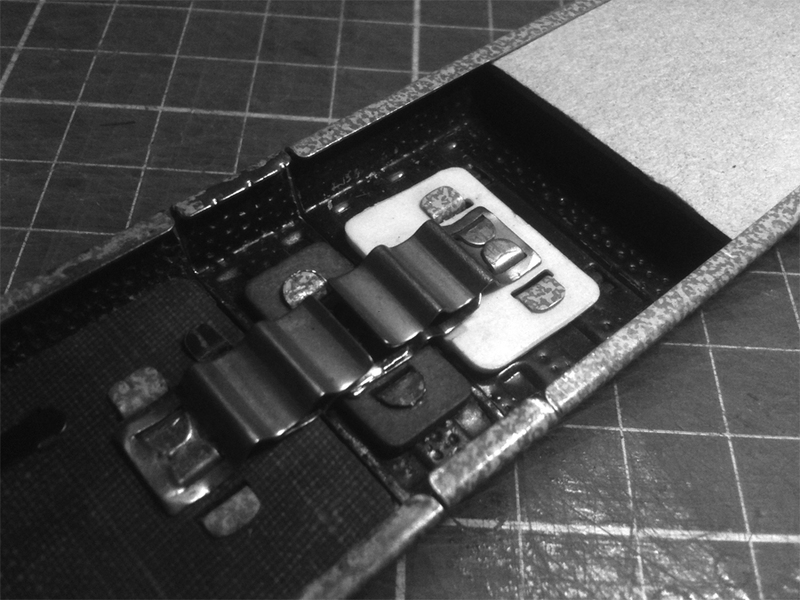 Re-install the insulator plate, followed by the centre rail and connector lugs. 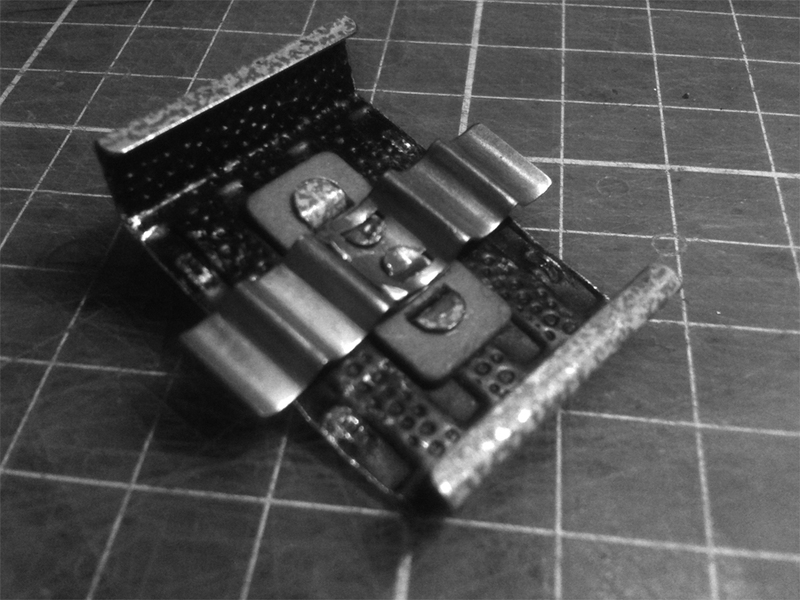 The whole assembly would benefit from being soldered together, so clean the parts accordingly before putting them together. Cut the rail ends with the fish plates to the required length and clean up the ends. Test fit between two other pieces of track. From 1.8mm box board, cut a rectangle 37mm wide by about 50mm long and angle the corners 45°. This slides in at the bottom of the road bed to hold everything in place. If using anything other than cardboard, then the material must be non-conductive! 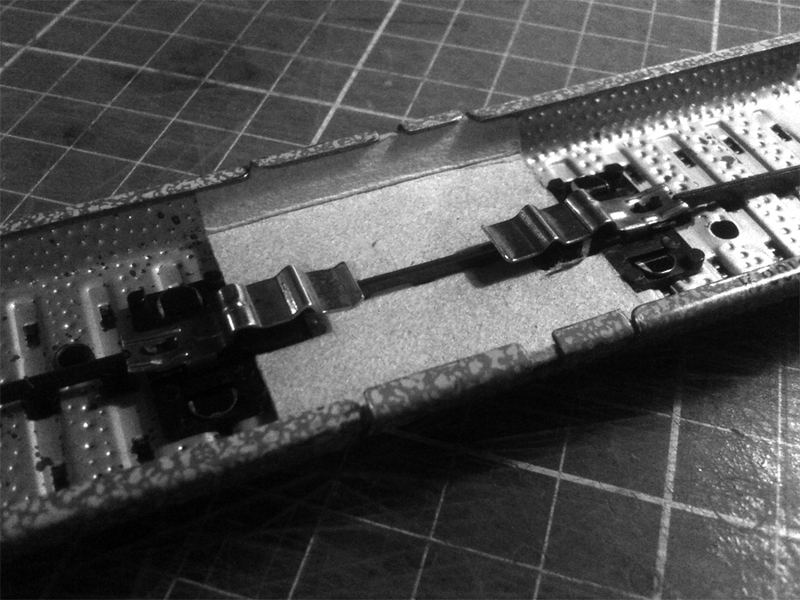 Note that up to two compensators can be cut from one 3600D section, however, fish plates and connector lugs for the second piece will need to be scavenged from elsewhere. The parts that make up the new track piece. Shown at the left is a 13mm length, at right a 26mm double length. 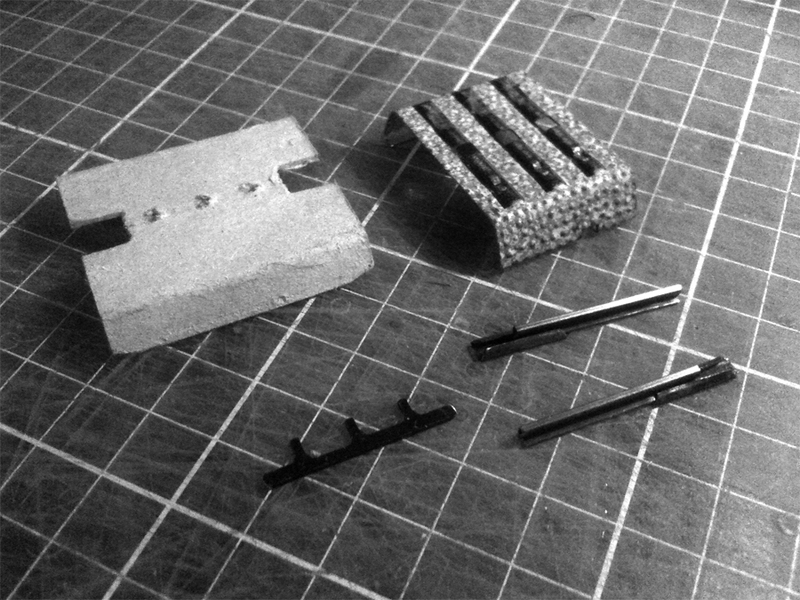 While these two elements are required to complete the standard track assortment, any length that may be needed can be made in this way. 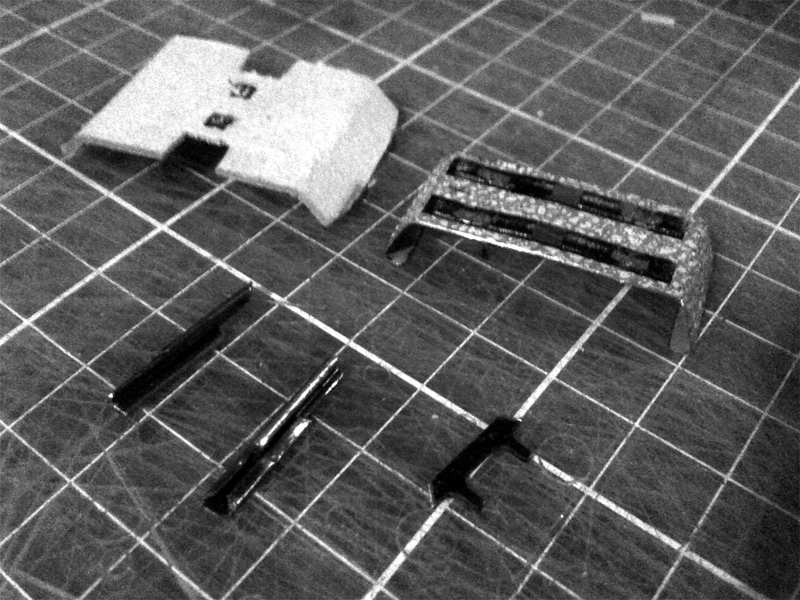 The fully assembled piece in between two others seen from above. The same setup seen from below. Note how the cardboard butts up against the black plastic insulators of the neighbouring pieces. This prevents the centre rail from being able to move even without any glue. Straighten out the tabs holding the centre rail and remove this carefully. 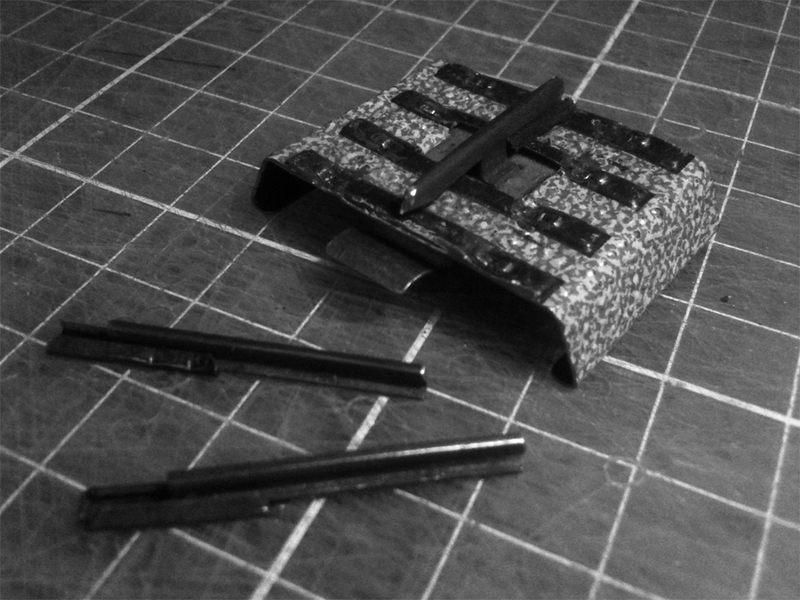 Next, clamp the track piece in a vice and cut off the rail ends with the fish plates to the required length. Clean up the cut ends with a file and some emery paper. Remove the remaining rails from the track bed and push the lugs that held the rails back into the sleepers. Mark a section of the road bed to the required length, making sure the cuts are nice and square. Clean up the cut edges with a file and some emery paper. Using the hammer, carefully tap the sleepers flat in the area where the rails will sit. 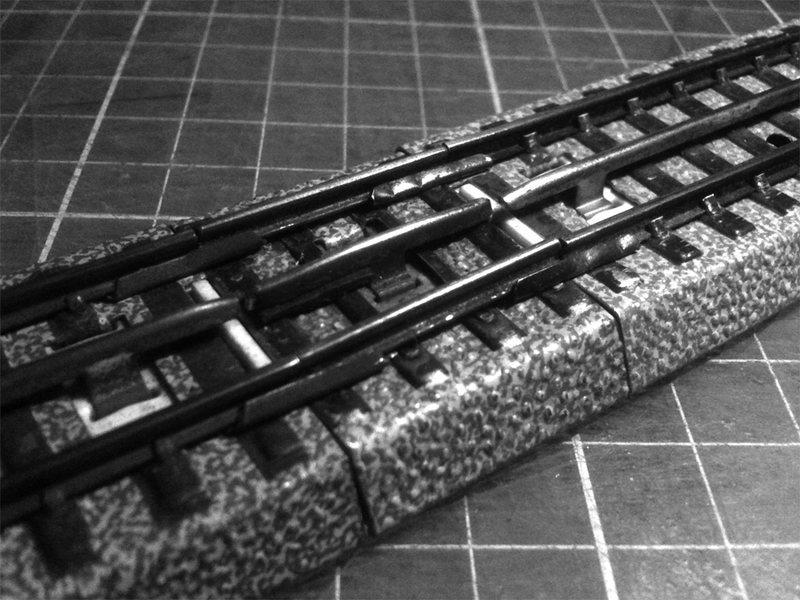 Cut a length of the centre rail to match the road bed piece. When in position, the studs must not be in contact with the roadbed, as otherwise a short circuit will occur. From some cardboard (1.8mm grey box board works well), cut and fold a piece to exactly fit under the road bed and protrude 6.5mm on either end. Cut out notches to accommodate the contact lug from the adjoining pieces. Test fit with rail stumps in place, then mark the position of the centre rail holes on the card board. Take the whole thing apart again and punch slits in the cardboard. A small screw driver will work quite well for this task. 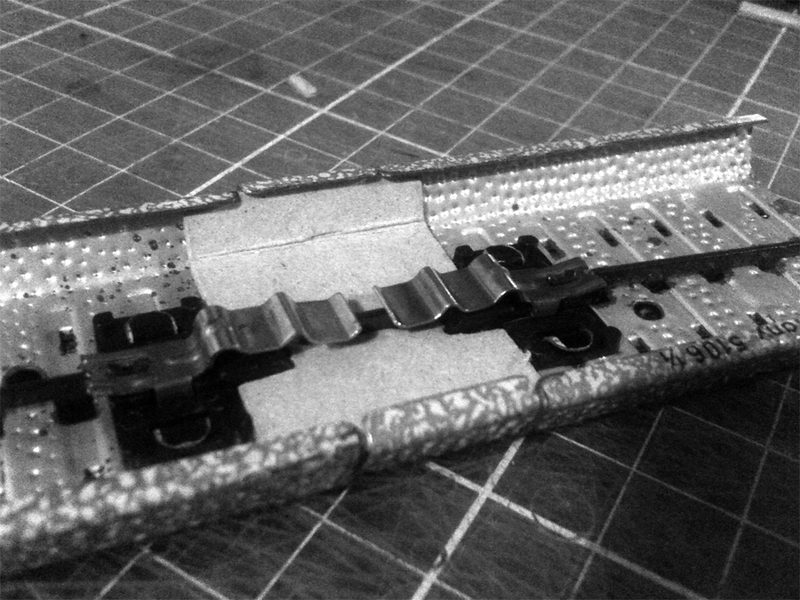 Re-assemble the track bed and cardboard elements, then insert the centre rail segment through the slits. 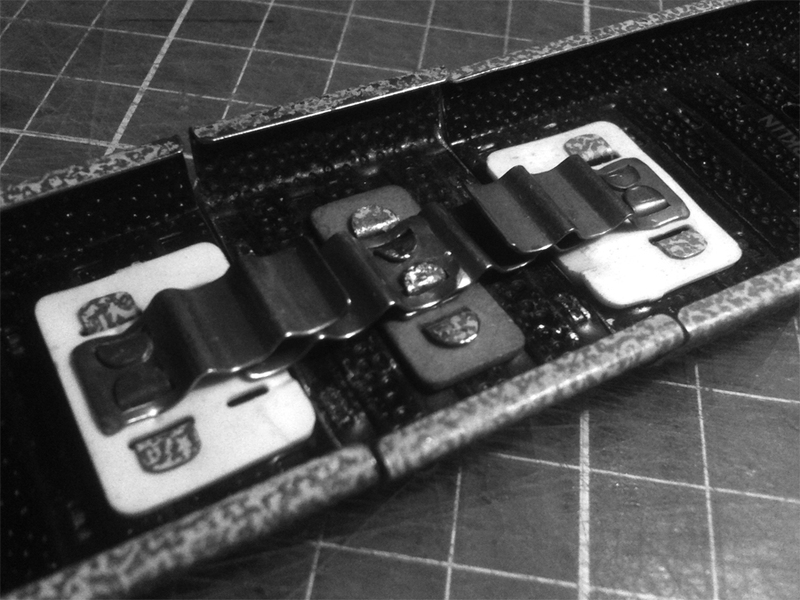 Note that several compensators can be made from each piece of 5106 track, however, there are fishplates for only one. Your custom-made compensating track is now complete!